There are some HUGE dental websites out there. Naval destroyers that cruise the internet seas. For example, AspenDental.com, or 1800Dentist.com. These websites are daunting, and unfortunately, these are the websites that we small offices compete against. I imagine my small office similar to David and his battle with Goliath, which is a story I have always liked. We may be a small dental office but our website can compete with the best and we are not holding back. I recently received some email from Zachary Kulsrud from Dental Economics asking if we would like to have our website evaluated. I was a bit apprehensive, but since my goal is to have the BEST dental website in the world, I submitted our website for review. No pain, no gain. As I said before, we made this website; it’s been a labor of love, it is my baby. I knew ahead of time that any criticism would be painful. Deep breath. OK, here we go. 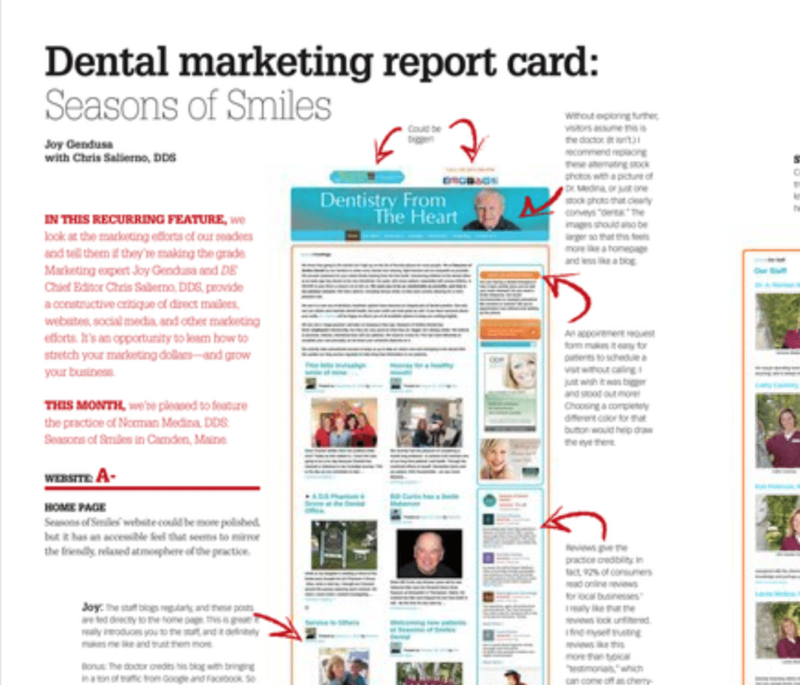 Check out our Dental Marketing Report Card Here. We got an A-! I was hoping for an A+. Now I have an incentive to improve! I was hoping to have a bit more dialogue when discussing our office website, but I guess it wasn’t meant to be. I would like to address some of the criticisms that were made. “Could be Bigger” – The logo and call to action buttons at the top have been optimized for a responsive website. They need to look good on a large screen as well as a smartphone. Go check it out in both; I think you’ll see what I mean. I think the size is correct. “I just wish it was bigger, and it would stand out more” – The “Make an Appointment” call to action button was done in orange as well as our “No Insurance, No Problem” button with the idea that it will stand out. These are significant links for us. I agree on anything we can do to have these buttons stand out, the better. “I recommend replacing these alternating stock photos with a picture of Dr. Medina” – These photos are not stock photos. These photos are photos of our patients. These photos are the real deal. These people are OUR rockstars of Midcoast Maine. These photos show lots of great smiles; it highlights the product that we provide. I have seen plenty of dental websites, where the dentist’s photo or video is highlighted at the beginning. The product the website is selling is the dentist. I understand. However, which is better to highlight, the smiles or the dentist? I have given much thought to this question, but I’m not sure which way is better. Or maybe I need to find a way to do both? “Birthday Postcard – B.” Joy Lebowitz Gendusa is the GURU in the postcard world. I’m surprised she gave us a B?!?! We love our Birthday Postcards because they are personalized. I have an office full of ladies that would disagree with the “B.” We love our patients, and I do hope that our birthday card conveys our appreciation for each one of them. PostcardMania gave us 5000 cards as a gift for participating in this evaluation. Thank you, Joy for your generous gift. If you live in the Camden area, check your mailbox, you may be one of the lucky 5000. The other evaluator for our office website report card is Chris Salierno, DDS. The first thing I did was google “Dr. Salierno’s” name. From what I can see Dr. Salierno practices in Melville NY. I was pleasantly surprised to learn that he is also the chief editor of Dental Economics. I feel fortunate to have had the opportunity to show him our website. I was also surprised to learn that he has his own dental website as well, The Curious Dentist. I enjoy looking at different dental websites via google, and I have seen his website show up numerous times on my Google searches.